Almost two months ago, a close family member suffered a devastating stroke. It was a Sunday night, and he and his wife were planning to watch The Amazing Race – or whatever reality show is on that night. (To protect their privacy, I’m going to call them George and Gracie.) George was the type of guy who was always busy, always working on something. He seemed to be in great health, other than an injured shoulder, and he hadn’t complained about not feeling well that day. Gracie had gone to take a shower before the show started. When she came out, she saw George slumped over on the bed, and it seemed he had vomited. She was worried he was sick, but she thought he was being overly dramatic about it. She quickly realized it was far more than an upset stomach and called 911. George was transported to the local hospital, then immediately transferred to the huge regional hospital with better facilities for treating stroke patients. I don’t know nor understand all the specifics of the stroke. George wasn’t even 50 at the time of the stroke. It was determined that nothing he did caused the stroke nor could have prevented it, because he was diagnosed with a very rare condition called Moyamoya that caused his carotids to become completely blocked. 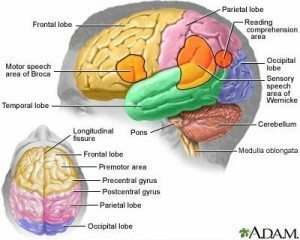 George’s stroke was in his right hemisphere, and there was evidence of 4 or 5 previous strokes that no one was aware of until then. He was completely paralyzed on his left side. The left side of his throat was also paralyzed, making speech very difficult. He also couldn’t swallow, so he couldn’t eat or drink anything. It was obvious in the first few days of his recovery that his intelligence was completely intact. He could write out notes that asked intelligent questions or made snarky little jokes – just like he always did. It was obvious George was still “in there”, but he was “trapped” by his body that just couldn’t respond the way it used to. George was at the regional hospital for about five days for medical treatment, then he was transferred to one of their intensive rehab facilities. My family and I have visited with George and Gracie at least once a week since the day after the stroke. Each time we saw him, George had made progress. He was working hard in physical, occupational, and speech therapy. Gracie, who stayed with him every day and night while he was hospitalized and in rehab, said he’d work hard for the therapist but didn’t like to do his exercises on his own. Who could blame him, because a lot of the things I saw him doing looked boring. But therapy lasted only a short while each day, and progress was going to require him working on his own. I care about George and Gracie, and I wanted to help them in anyway I could. We live about 1.5 hours away from them, so I couldn’t just pop over and help out every day. We aren’t rich, so I couldn’t finance 24-hour in-home care for him. Then I started thinking about how the iPad has impacted the lives of disabled people and wondered if anyone had used it in stroke recovery. I found several news stories about how Florida Hospital Oceanside had been successfully using iPads with an aphasic stroke patient. Unfortunately, that application allowed the patient to touch an icon and a synthesized voice would communicate simple messages. That’s not what George needed, so I started searching the internet and the Apple App Store for more ideas. I found another story on MSNBC about two Australian neuroscientists, Stuart Smith and Penelope McNulty of Neuroscience Research Australia, who had been using iPad, Kinect, and Wii games to make physical exercises less boring for stroke patients. Smith found that Fruit Ninja on the iPad was especially useful for improving fine motor control in patients. Searching the App Store turned up several applications that were developed for aphasic patients so they could tap an icon to have a voice speak for them. Best of all, I found an app that had videos demonstrating all the mouth and tongue exercises that would help improve George’s throat paralysis, swallowing (so he could have his beloved coffee again! ), and speech. Unfortunately, George and Gracie didn’t already own an iPad and now wasn’t a good time for them to make such an expensive purchase. Butch and I talked about it, and we decided we’d buy an iPad for them as our best way of helping them. We got an iPad 2 at the local Apple store. I didn’t want to initialize the iPad on my iTunes account; it needed to be associated with Gracie’s existing iTunes account so they could get updates for the apps I planned to add and to add new apps later. We had the Apple associate initialize the iPad for us. I was able to set it up completely without ever connecting it to a computer – at least not until I had access to Gracie’s computer. And by the way, when I did connect it to Gracie’s computer, it connected and synced with no problems. All the apps I had purchased on the iPad 2 were transferred to the computer without a hitch. George had made a great deal of progress, but he was still physically recovering, so I thought a sturdy case to protect the iPad from spills and drops was necessary. 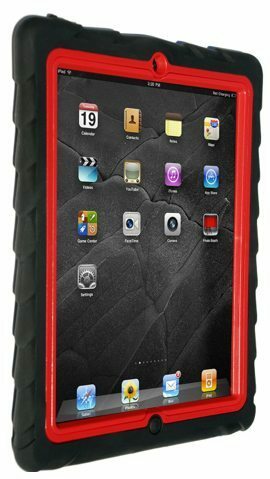 I searched around on Amazon and found the GumDrop Drop Tech Series Case for iPad 2. 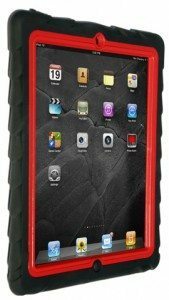 I liked this case because it completely covered the iPad 2. The buttons were encased but easily usable, and all the ports had attached covers over them. There was even a replaceable screen cover. Only the camera lens was left uncovered by this case. The case has a deep “tire tread” pattern that improves your hold, and it’s thick and padded enough that it should protect against shock and bumps. This case is heavy, but I like it a lot. I used it for a couple of days on the new iPad as I was loading it up with the apps. The case does add weight and size to the iPad, but it’s not uncomfortable to hold. Because of his paralyzed left arm, I realized that George would need to use the iPad while it was in a stand. The GumDrop case is so thick, I didn’t have a stand that would work well with it. I remembered that I had a ThaiPad from Levenger. This padded pyramid-shaped pillow supports books, tablets, and ebook readers. I thought it would work well for George, because it would be soft enough that he could put it on his lap or even on his chest as he lay in bed. I tried it with the GumDrop-encased iPad and found it worked well. Gracie trusted me enough to tell me her iTunes password, so I bought an iTunes card for her account and got busy loading up apps directly onto the iPad 2 from the iTunes app store. Of course, I added Fruit Ninja HD. I also added Angry Birds HD; I thought it might be a fun way to work on fine motor control and reasoning skills, too. I thought CHALK_BOARD, a simple drawing program, would be handy for George to write a note if no paper was near, and they could always play simple paper-based games like Hangman or Tic-tac-toe. I added Montessori Crosswords, a spelling game for children, because it reminded me of a letter arranging activity the therapist had George doing. Hopefully these games would prove more interesting than actually pushing letter tiles around on a tabletop, and George would be able to work on his fine motor control without being bored. I was most excited about a series of Lingraphica apps from The Aphasia Company. The SmallTalk Aphasia – Male app has a simple vocabulary of phrases, spoken in a normal male voice – useful when George needed something but couldn’t make himself understood. (It’s also available with a female voice.) SmallTalk Letters, Numbers, Colors has a series of videos showing the mouth and tongue movements needed to say the 26 letters of the English alphabet, colors, and numbers 1-20. You are shown a tile with the letter, number, or color displayed; tap it to see a video of a woman slowly pronouncing the word. The SmallTalk Oral Motor Exercises app has 53 videos demonstrating cheek, tongue, palate, lip, and jaw exercises designed to strengthen oral musculature. All these SmallTalk apps are iPhone apps, meaning they run in the small window on the iPad. However, the videos are easy to see in the small window and remain clear enough to easily use even when screen-doubled. We gave the iPad to George and Gracie at the end of August, about 1 month after his stroke. At that point, George had made quite a bit of progress, but he still wasn’t allowed any food or drink by mouth because of his throat paralysis. His speech was still difficult to understand, and you could see the effort he had to put into talking. I spent some time showing George how to use his apps on the iPad, and he immediately started trying the oral exercises. Gracie was excited to see that application; she said the exercises demonstrated in the app were exactly like the ones used by the speech therapist. They had been given a printed list of these exercises, but it was hard for George to remember how to do all of them. After a while, Gracie and I started going over these and other apps, and I was giving her a general lesson on how to use and maintain the iPad 2. George, who often seemed to quickly lose interest in things when we had visited previously, actually tried to get himself out of his wheelchair and onto the bed so he could see what we were doing. I’m sure he wanted to see what we were doing with the iPad, because he picked up his ThaiPad stand before he started trying to get on the bed. In the following week, Gracie said that George loved using the iPad and was working much harder at his oral exercises. By the end of the week, he passed his swallowing test and was allowed to have food by mouth for the first time since August 7th. I’m not saying that one week of the iPad improved him so much that he passed the test, but I am saying that he didn’t balk so much at doing his oral exercises. Gracie said they took the iPad to one of his speech therapy appointments and showed his therapist the apps. Gracie said the therapist liked the apps and said they were exactly the exercises George needed to do. As a note, I only had a short time to show Gracie how to use the iPad in general and how to do general maintenance functions. The next weekend, I asked her if she wanted me to show her how to do anything we had talked about or anything new she’d thought of. She looked at me like I’d lost my mind and said she didn’t need any refreshers. The iPad 2 is so intuitive, she only needed a couple of minutes of instruction and she was off and running. For his 50th birthday last week, George received a Wii Fit Board. We’ve heard about how the Wii helped senior citizens maintain and improve their physical abilities. Hopefully the Wii Fit works as well for stroke patients and will help George continue to improve his strength and balance as the iPad has helped with fine motor control and speech. Apple haters can scoff all they like, but I think Steve Jobs hit the nail on the head when he said the iPad is magical. At least it’s helping George work some recovery magic. Note: Brain picture is from PubMed Health. Product pictures are from their respective vendors. Great article Janet!!! It’s amazing when technology like this really can help make a difference. Thanks, Julie. Yes, it’s great when something that seems like little more than a toy to a lot of people can do something so important to help people. Fantastic article, and what a way to make a real difference in someone’s life. A great article indeed. Kudos on the research you did and to “George & Gracie” for using the tools to help recover. I hope this research helps some other person affected by stroke. It made me look at the iPad in a brand new light. Thank you. @Matt Penning Thanks for the kind words. What’s so amazing to me is how serious therapy exercises can disguise themselves as fun games on the iPad. Putting together all those apps was amazingly cheap, too. All the apps cost less than $35, and that included a couple of things just for Gracie. Just shows that of all the gadgets we write and read about the brain is one of the most amazing ones. Wishing all the best to Gracie and George ! Thank you, Ian. Yep, the brain is amazing, and it’s nice when one of our “toys” proves so beneficial. I suffered a stroke six months ago. Have clawed my way back to life with the help of my loved ones, therapists, nurses, and doctors, and I love my new I pad. It has allowed me to read again comfortably . George and Gracie have courage and continue to work work work George. My brain began compensating the day after my stroke and I have made progress everyday. You would not know by looking at me or talking to me that I was paralyzed on the right side half a year ago. I, too did nothing to cause my stroke. So, if you think you may be having a stroke, go to the emergency room. Immediately. Time is of the essence. While I have not been able to return to work as a lawyer,yet. I have had and will continue to have great happiness. @Leslie carr Thank you for telling your story. I am so glad that you have made such incredible progress in such a short time, and I hope you continue to progress quickly so you can return to your work. I’m glad the iPad has proved useful to you in your journey of recovery. Hi Janet, thank you for writing this article and sharing this amazing journey of recovery! Also, thank you so much for mentioning all three therapy disciplines, as they each have an important role in recovery. The iPad is a great tool and offers so much more than “entertainment”. Thank you again for sharing!! @Carrie Thank you for the kind words. I read somewhere that you could think of it as physical therapy is for the legs, occupational therapy for the arms and muscles above the waist, and speech therapy for the voice, throat, and face recovery. Using the iPad may not help you walk, but it does seem to be a good way to use your arms and keep your brain engaged. And those oral exercises he does really seems to have helped George’s speech improve. @Billy B Thank you for sharing your story. I hope you can find a lot of things your wife can use on her iPad. I wish you both the best of luck! Great to hear that your uncle has had so much success using the ipad for recovery. Just to let you know, encourage your uncle to keep up with the Wii (or equivalent) as well – Dr Penelope McNulty from Neuroscience Research Australia, who you mentioned in your post, has had a lot of success using Wii fit with people who have had a stroke – the improvement in their movement after just 2 weeks of training is quite amazing to see. Good luck. Thank you so much for this information and good wishes. George isn’t my uncle, but I’ll be sure to pass along the information. We visited them again last weekend, and George was “playing” on the Wii while we were there. I truly find it amazing the benefits that can be reaped playing games on these devices! @Steve Leveen Thanks for the kind words. I wish the best to your friend in his recovery. My dad was diagnosed with soem agressive brain cancer, and in the course of a year went down hill pretty quickly. Talking was harder, words were hard to find, watching TV was too hard to follow, there was very little to stimulate his brain. But then his friends bought him an ipad. One of the most important parts of it was voiceover, which was semi-easy to learn (it did take some work) but if he didn’t understand something he turned it on and heard it said to him. It was hours and hours a day on that thing , one of his only connections to the outside world of the house, and we don’t know what we would have done without it. The intuitive nature, the accessibility features, the millions of apps he played around with — we honestly believe it improved quality of life. That’s pretty awesome. Might be a bit late, and I don’t know if he’d need it or if he has the dexterity to use it, but there’s a free app called Verbally (http://verballyapp.com/) which was created for a woman who lost her voice due to ALS. It’s a speech-generating alphabetic keyboard with core words and text prediction. In 1981, 30 years ago, we got our son a computer to help with stroke damage repair. He gained a whole lot of fine and gross motor control on both sides of his body. He loved his computers and we are thankful they can be such useful adjuncts to brain damage. I’m glad that the ipad and other ‘pads’ are capable of continuing the help, three decades later. What an awesome article. In the interest of full disclosure, I need to admit my Android bias, but this article is really inspirational. So often technology is seen supplementary or superfluous if you’re not a “geek”. But this is an excellent example of technology aiding recovery on what I would consider a foundational level. Thank you for sharing such an authentic and moving post. @Tyler How wonderful the iPad could keep your Dad connected to the world! The iPad can be so many things – a source of entertainment, of news, a source of assistance – most anything you need it to be. @Hinerangi George can speak, and he is using the oral exercises I mentioned to improve his speech. But it was a program like the one you mentioned that got me started on my search for apps. Verbally sounds like a wonderful aid for people who have lost their speech, though. @mjh I’m very thankful that machines that started out as just business tools have proved to be such a help in a more personal way to many people. @ GiqueGEAR_Todd Thanks for the kind words. @Janet Cloninger We started our experiments to try to help our son on a Commodore 64 system with a tape deck and TV set as a monitor. He thought it was great fun, thankfully. Over time, he had significant improvement. @mhj When I was researching using the iPad in stroke recovery, one medical professional said great progress could be made if the patient would just push a sand-filled bag across a tabletop over and over, but nobody wanted to do that the thousands of times needed to improve. You have to make the activity more fun, and that’s where computers like your son used and George’s iPad come in. It’s easier to keep working at it if your therapy is fun and interesting. And sometimes the appeal of the gadget itself is enough to keep you going, too. It’s not exactly the same thing, but my friend’s nephew hated reading and loved gadgets. I suggested she pass along an old Sony reader to him to see if that appealed to him. He read on that old reader until it was worn out and got a new Kindle last year for Christmas. Gadgets bring joy and benefit to our lives in many ways. Thank you for such an inspiring and motivating account of how you were able to help your friends. My dad suffered a stroke ten years ago and has been severely handicapped since. I am not sure if the ipad would be able to help him after all this time but you have got me thinking about the wii and how that would be a fun activity for him to do and one the grandkids would happily join in with, and if it helped improve any of his disabilities then it is a win win for all. You sound like an amazing person to have considered your friends so much, and then to recount this so well so that others can learn and benefit too. Thank you! @Sue Prendergast Thank you for your kind words! I hope the Wii will prove to help your father improve his physical condition, and I know that playing games with their grandfather will make great memories for the kids and him, too. Good luck to your father and your family! My stepdad has a moyamoya disease since January 3rd, and we never heard of it until then. We worried about him more than often. He has repeated strokes for more than a year, and still has strokes. The other day, I was staying the night at my parents’ house and he was sitting on the couch reading a magizine. The odd thing was, the magizine was upside down. I do not know if this is common for moyamoya, but i do not understand how he can read it upside down and not know it. I only knew of one woman from Illinois they have found to share the expericances. He is unaware that he says mean things to us (he has always been a kind man, it is unusual for him to be mean), he would have siezures, a kind of siezure where he sits and stare blankly, his brain stopped working, and he doesnt know he was doing it. He already had his physical and speech thearpy, he is doing fine in that area, but he is still sick, seeing things that arent there, thinks something happened that didnt, and doesnt do much like he used to. I do not know how to have a relationship with him as father and daughter anymore, I do not know how to talk to him. He is a completely different person now. He likes to eat all the time, and being diabete since he was diagonsised with moyamoya, has limited his variety of food. If I get him an Ipad, what could he do with it? He has a laptop he can play on, but the bright lights hurt his head. He likes to be in the shady warm place. I can’t afford an Ipad either. What can i do for/with him? Janet, my dad had a stroke back in March. He is improving slowly. My uncle is getting him an iPad for Christmas. He would not yet be able to benefit from a Wii as he still does not have the use of his right arm. He is beginning to walk short distances. His speech right now needs work so I hope some of the apps will help him. Any other helpful apps that you have come across would be very helpful. Thanks again. @Steve Bowden Be sure to look for all the SmallTalk apps I mentioned. George’s speech therapist said all those vocal exercises in those apps were exactly what he needed. They’re all free, too. I wish your dad the best of luck. One thing Gracie said was that apps like YouTube and other apps for watching TV or movies do NOT help George. He has some problems with impulse control, and he can’t seem to stop watching videos instead of doing his exercises and stuff. He’d do better playing games that engage his mind and body. @Amber I’m so sorry I didn’t notice your comment for such a long time. I’m sorry that your father is having so many problems. I don’t have any medical knowledge, so I don’t know what to suggest to you other than to talk with his doctors for suggestions about how you can help him. It might be good to ask your doctor if you should be evaluated for Moyamoya, too. Dear Julie, Your article is great..Any way you could provide a comprehensive list of the apps and videos you put on the Ipad ..and how one may find it..Sounds really wonderful..My uncle has had a stroke and has been in recovery for two years. I believe what you did could truly be beneficial for any stroke patient. Recently his family purchased an ipad for him..Any guidance would be much appreciated..Thank you in advance..
Lily, I didn’t put a lot of apps on the iPad, but you can find links to everything I did in the article above. All the apps are listed in the two paragrahs under the picture of the iPad sitting on the Levenger Thai pad. You can just click on the names of the apps to find them in the App store. I didn’t put any videos on; the apps themselves contained the videos I mentioned. Everything I mentioned, including a couple of apps I bought just for Gracie cost less than $30. Good luck to your uncle and your family as he recovers! excellent info, my father had a severe stroke in march, I’ll be picking up an iPad for him this weekend. @Ryan Good luck to your dad in his recovery! I am a Speech-Language Pathologist who uses the iPad every day in my treatment of stroke survivors and brain injury patients in a rehab hospital. I have developed special therapy apps for aphasia (loss of language after stroke) through Tactus Therapy Solutions (www.tactustherapy.com). I use over 200 apps for various therapy programs and have listed some of my favorites on the site. Thanks for publishing such a great story and inspiring others to use this great new technology as part of their recovery. @Megan Thanks, and good luck to you and your rehab patients. @Denise I’m so sorry about your brother’s stroke. I’m sorry I don’t have any recommendations for more apps. George made amazingly rapid improvement for several weeks, and he’s able to walk now and has regained a lot of function of his arm. He can talk, so he doesn’t need the aphasia apps. He still uses the iPad, but it’s more for entertainment now. I wish your brother and your family and you luck in his recovery. My husband has had a series of 5 strokes over the past year. four of them he recovered from within a week with no serious deficits, the fifth was worse. He hides the damage well, but one of the most frustrating is the inability to write with accuracy and fast enough speed to take notes. I have been looking for an app where he can use the stylus we gave him to practice writing, like the old fashioned lined paper with dotted letters with not much success. Good Luck with your uncle. I am amazed at what the brain controls and does. Thank you so much! This information is exactly what I’ve been searching for. After watching a news clip on how the iPad can help autistic children communicate, I thought I could find something similar to help my mother supplement her therapy while in rehab from a stroke that has rendered her unable to talk, eat, walk and go to the bathroom on her own. She is 1 week out from the stroke now and doctors say her prognosis is good (which is baffling considering how far she has to go to return to normal function). I spend about 6 hours a day with her and I can’t wait to show her all the fun “games” that you mentioned in your blog to help her recovery. Thank you, Thank you, Thank you. @Karen I wish you and your mother the best of luck in her recovery. The speech videos will help her perform her exercises, and playing games will hopefully hardly seem like therapy at all. I was excited to see that you uncovered our use of Fruit Ninja on iPad for stroke rehab. I’d love to find out how you have been using games on the iPad to help out with rehabilitation. If anyone else would like to send me their story I would be keen to hear it. I am working towards a full scientific evaluation of iPad technology for stroke rehab. Thanks for sharing! And everyone else for their comments! I recently graduated university and am working on building an app for stroke patients called StrokeLink. There is so many great resources both online and in the app store, I hope StrokeLink can help guide stroke survivors to such places! I was wondering if there are similar computer based tools for non-english speaking patients? My mother lives in Croatia and she had stroke 15 years ago. One of the biggest problems she has in aphasia and I was wondering if there are tools in other languages she may be abe to use. Great article. It has provided me with a starting pad to help my uncle in a similar situation. I would be very interested to read a follow-up article. Best regards and well done. Janet, I just came across this blog quit by accident. I was searching for someway to help my brother, who through a stroke is paralyzed on his left side. My brother by the way is left hand, and is having to unlearn his right brain thinking in order to use his right side. Your blog was excellently what I needed. I to can’t afford an iPad for him, but I am sure going to work hard to get one. Thank you for this post Janet it has been so enlightening for me in how I can possible help my brother. I’m hoping there is an app that will teach him how to write as well. God Bless you. KC, I wish the best of luck to your brother in his recovery! I was wondering if the same tool for stroke recovery that is offered for iPad is also available for regular laptops? There’s not a single tool for stroke recovery, but a series of apps that offer different features. Perhaps the videos that help practice speech might work on a laptop, but I think a lot of the benefit comes from interacting with the touchscreen with a hand. You don’t have to be able to grip and manipulate a mouse with the iPad. Thanks for the great information! How is your friend George doing now? 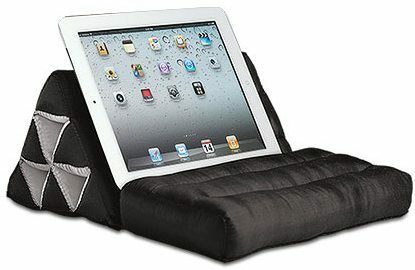 I am researching how to create a GOFUNDME specifically for the iPad & apps that you recommended, and the case and soft stand as well. Thank you for providing links for those. Additionally, I was trying to find a mount for his hospital bed, but most are specific to the case being used. Any other information would be SO useful ~ Thank you! Icame across this site as i was searching the web for a young man who has had a stroke. He is 58. Could you let me know if the iPad 2 would still be good, or is there something newer to help him, as he gets depressed and i thought if he had something to keep him occupied what a blessing it would be. Please if you can help, my email address is there for you to reach me. I think an iPad would benefit your friend. I’m sure many people would say other tablets would work as well as an iPad, but I don’t know if all the apps I mentioned in this article are available for Android tablets. I wouldn’t buy an iPad 2 though; I’d buy one of the newer models of the iPad. I’d stick with the 9.7″ iPads, because I think the 13″ version of the iPad Pro might be hard to hold if he has any arm/hand issues and the iPad mini might be too hard to see the screen and hard to hold because of its small size. The nice thing about using an iPad is that he would be able to work on his recovery using the apps I mentioned (and there may be more available now), and he could use the iPad for other games, videos, books, and other apps for entertainment. I wish your friend a speedy recovery. I have sent this site to my friend, and hopefully she will be happy to get it for her son. Thanks for your good wishes for this young man. I checked out the ipad 9.7″ that you mentioned. Its way beyond what I could afford. Live on a small pension.. but thank God for everything. Hope Ipad 2 would work, looking for a used one. Thanks for everything, and this site is really a big help. Yes, an iPad 2 should work with most everything. It’s just an older unit, and I know that eventually Apple stops supporting the older units, and new versions of the apps won’t work when that happens.